Georgia Ruth has won this year’s Welsh Music Prize. 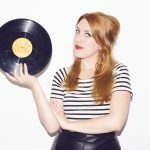 Beating the likes of Neon Neon and Euros Childs, her album ‘Week Of Pines’ scored the third annual prize at ceremony which took place as part of the Swn Festival, which is currently taking place in Cardiff. Speaking to BBC News the folk-influenced artist said the win was “quite a shock”. Of the ceremony she added: “there was quite a lot of tension in the room, it kind of felt like I was back at school.” Click above to watch the video for the album’s title track. The annual award, now in its third year, celebrates the finest Welsh music of the year as well as music made by Welsh people around the world. Created by Radio 1 DJ Huw Stephens in 2011, previous winners have included Gruff Rhys and Future Of The Left. “We’re chuffed for Georgia, because we know how hard she’s worked on her career,” said Stephens of Georgia’s win. Judges, including NME editor Mike Williams, chose the winner from a 12 track shortlist which included Neon Neon, Euros Childs, Sweet Baboo, Racehorses, Winter Villains and Little Arrow.